Who doesn’t love brownies? Soft, moist and extra fudgy with a shiny slightly crackled crust. A homemade goodness for the whole family. And with this recipe you can enjoy them over lent as well! As no butter is used, this is a much much healthier alternative to the traditional chocolate brownie recipes, and despite being an indulgent delight, is far lower in calories, fat and cholesterol than the traditional brownies! This Mediterranean inspired Lenten chocolate brownie recipe is based on a secret ingredient: tahini! Tahini replaces butter and milk in many Greek Lenten desserts and it is the perfect match for chocolate. It will give a slightly nutty taste and an incredible chewy texture to your brownies, which is exactly what they need! Besides helping with texture, tahini is also well known for its numerous health benefits. Tahini is packed with essential vitamins and minerals; is an excellent source of copper, manganese, healthy fatty acids, omega-3 and omega-6 and also a very good source of calcium, magnesium, iron, phosphorus, vitamin B1, zinc, molybdenum, selenium, and dietary fibre. It helps promote cardiovascular and brain health, lower cholesterol and prevent high blood pressure. Tahini also helps tone up your blood vessels, which enhances blood circulation and has great antioxidant properties. (Make your own homemade tahini with this easy 2 step tahini recipe). So if the kids insist on having some super chocolatey brownies, give these healthier butter and egg free brownies a try, as they have nothing to be jealous of the full-fat butter and egg based chocolate brownies and are much healthier as well! To prepare these delicious Lenten chocolate brownies, start by melting half of the chocolate (100g). To melt the chocolate it is best to use a bain-marie (or double boiler), a piece of equipment used to heat the chocolate gently and gradually to fixed temperatures so that it doesn’t burn. If you don’t have a Bain -marie, break the chocolate into small pieces and drop into a heatproof bowl. Set the bowl over a small saucepan about a quarter full with hot water and place the bowl on top so that it rests on the rim of the pan (the bowl should not to touch the water). Place the pan, with the bowl on top, over low heat until the chocolate has melted, whilst stirring occasionally. Set aside for 5 minutes to cool down. In a large bowl add the tahini, orange juice and cognac and whisk to combine. Pour in the melted chocolate and whisk again until incorporated. Add the flour, the baking powder and sugar and blend with a spatula, folding gently the mixture with light circular movements from the bottom up. You don’t want to overwork the mixture. Add the chopped walnuts and the rest of the chocolate (cut in pieces) and blend. Preheat the oven to 180C. Line one square baking tin (approx. 22*22cm) with parchment paper and grease with vegetable oil. Dust with cocoa powder and get rid of the excess cocoa. Tip in the brownie mixture in an even layer. Bake the brownies in preheated oven for about 25 minutes, until they have formed a shiny and dry slightly cracked layer but are still moist underneath (be careful not to over bake them). Set aside to cool down for about 20-30 minutes. 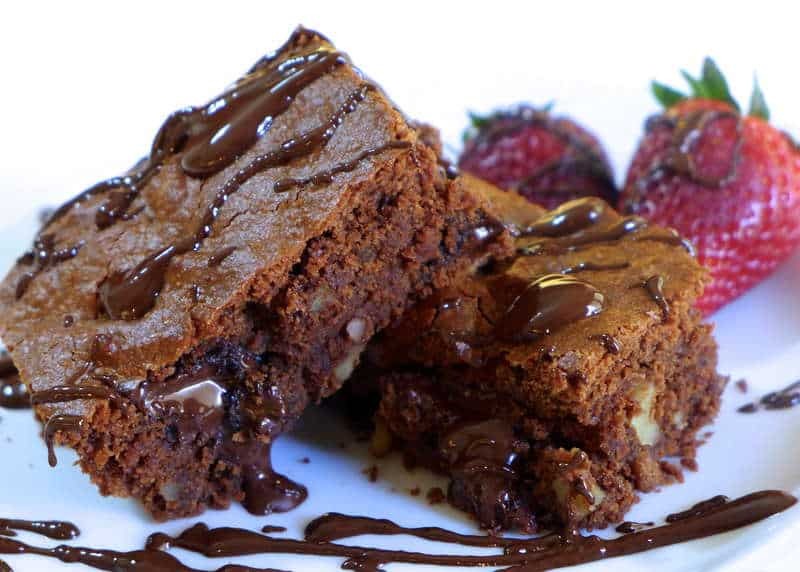 Serve these delicious Lenten chocolate brownies, while still warm with melted couverture and fresh strawberries. Enjoy!